On World Elephant Day, Sunday, August 12th, 2018, a giant elephant ice sculpture was placed in the centre of the distillery District in downtown Toronto. Throughout the day, the hot sun beat down on it as it rapidly melted. The sculpture is disappearing more each day and is expected to be fully melted by the end of the day on August 15th. In order to help stop the disappearance of African Elephants in the Wild, South African cream liquor company Amarula partnered with African Animal conservation organization WildlifeDirect to create global awareness of the plight of Africa’s elephants. This partnership sparked the creation of the “Don’t Let Them Disappear” campaign. Part of this campaign involved a donation of $10,000 from Amarula to WildlifeDirect for them reaching a goal of 10,000 Twitter RTs of a tweet about the cause. The ‘Don’t Let Them Disappear’ campaign was a success! 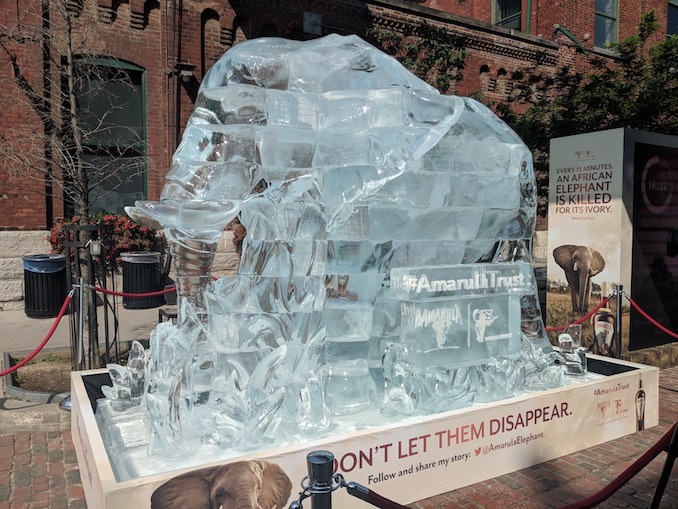 The posted tweet received 12,055 retweets from the @AmarulaElephant Twitter, surpassing the campaign goal of 10,000 retweets and culminating in Amarula Canada donating $10,000 to WildlifeDirect. For more information about WildlifeDirect and their partnership with Amarula, please visit their website.